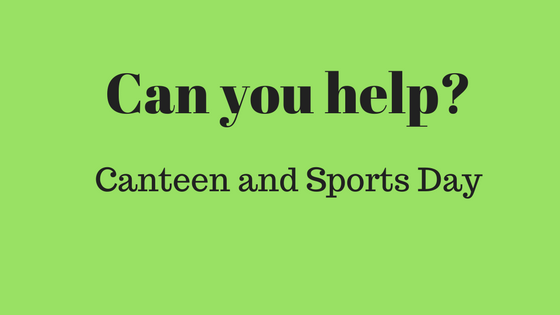 Volunteers are needed for the canteen on Sports Day! Sports Day is fast approaching (Friday 24th March) and we need lots of helpers for the cake stall, sausage sizzle, coffee stand and in the canteen itself. If anyone can spare even 1 hour it would be greatly appreciated. This is our major fundraiser for the year and we need the school community to support us so we can all have an enjoyable day. If you think you can help us, please let Sue and Sue know ASAP (canteen Ph. No. 82704568). We would be very grateful for donations of cakes, biscuits, slices and other homemade goodies to sell at our very popular cake stall. These can be brought to the canteen first thing on the morning of Sports Day (24th March) labelled with ingredients. Any containers should be clearly marked with your surname or child’s name if you want them back. As usual you will be able to buy scrumptious sausages (gluten free) from our BBQ under the verandah at the back of the canteen. The cake stall will also be there along with cold drinks, snacks and lollies. The canteen itself will be opened at recess and lunchtime. Please try to have SMALL notes as we do not carry large amounts of change, especially early on. All help is greatly appreciated and we hope you all enjoy Sports Day and thank you for your support.